As if taken from a Star Wars or Star Trek movie script, the term “exciton” (pronounced ˈek-sə-tän) comes from condensed matter physics. Excitons are bound states of electrons and electron holes attracted to each other by electrostatic force. They can be created both by light and transformed into light. Electrically neutral, these quasiparticles exist in systems like insulators and semiconductors, but University of California San Diego physicists have established a way that may bring them into future cell phones and laptops. While that digital usage remains a figment of a futuristic script, the UC San Diego researchers and their colleagues from the University of Manchester have reached a major milestone. According to Department of Physics Professor Leonid Butov, the research team’s earlier study predicted that specially designed excitons—indirect excitons (IXs)—could be created in new materials at temperatures higher than in previously studied semiconductors. Now, the researchers’ recent experimental work shows that IXs can exist at room temperature. This novel outcome opens the possibility for developing energy-efficient excitonic devices for computing and communication. The research findings were recently published in Nature Communications, in a report titled, “Indirect excitions in van der Waals heterostructures at room temperature.” In the paper, the scientists explain how they created artificial materials with IXs that overcome cryogenic temperatures and short lifetimes typical for most semiconductors. The artificial material featured in the paper was built from atomically thin layers of transition metal dichalcogenide (TMD), crafted in earlier work by the team of physicists. 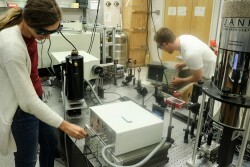 TMD is now created in the United Kingdom and measured by the UC San Diego physicists. The new study showed that the atomically thin layers of TMD offer the opportunity to realize artificial materials with designable excitonic properties, forming a new platform for studying fundamental physics and for developing optoelectronic devices. As a member of the team, Ph.D. candidate Erica Calman was trained in the UK and brought the knowledge of fabricating this artificial material to UC San Diego. Calman, who performed the measurements reported in the paper, explained that while the outcome of the research was theoretically discussed for years within science circles, to actually see IXs exist at room temperature was astonishing. “The fact that this was realized after being talked about for years, and to see that it actually worked right here, is a very, very big step toward practical application,” Calman said. Butov explained that up until now, scientific study of IXs has been limited to low-temperature conditions within semiconductors. In such structures, light is absorbed and excitons are created. The excitons transfer energy in the semiconductor and determine their optical properties, but excitons exist only for a short time before they become light. Regular excitons also are hard to control electronically since they are neutral. Therefore, IXs are investigated because they can live for a long time and can be electronically controlled. However, before this work, IXs were studied in semiconductors where they exist at low subzero temperatures. The research was supported by DOE Office of Basic Energy Sciences (award DE-FG02-07ER46449), and kinetics measurements were supported by the NSF (grant no. 1640173) and NERC, a subsidiary of SRC, through the SRC-NRI Center for Excitonic Devices. At UC San Diego, we prefer the path less traveled. And it has led us to remarkable new ways of seeing and making a difference in the world. Our Department of Physics’ graduate program in the Division of Physical Sciences ranks among the top 20 programs in the nation, according to U.S. News and World Report.